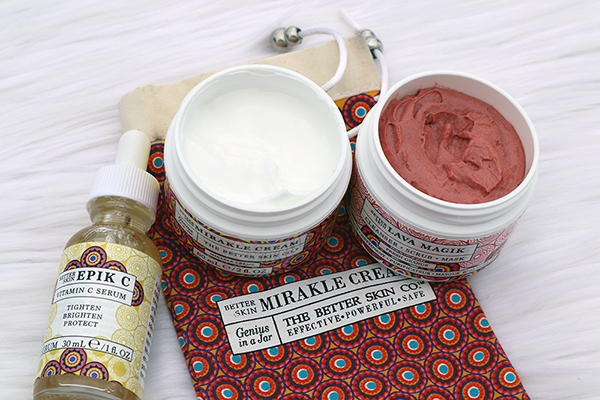 Happy ChinaDoll: Looking Younger with The Better Skin Co. ~ #Review Giveaway. Looking Younger with The Better Skin Co. ~ #Review Giveaway. If you haven't tried it yet, you have to try The Better Skin Lava Magik. It is one of my favourite exfoliants for your face. My skin has come to the point that I have to exfoliate often. If I don't, I notice that my face becomes dry and dull. Basically my face feels gross and haggard looking. When using The Better Skin Lava Magik you only need a pea size amount for your whole face. You don't want to waste it and you will notice there is a lot of product in that small amount. When you exfoliate your skin, do gentle circular motion. There is no reason why you need to put too much pressure and damage your skin. The Lava Magik contains pumice which is grounded down volcanic rocks. After you rinse it off, you will be gobsmacked how soft and healthy your skin will feel that you will be unable to stop touching your face. I would suggest to use this twice a week to help to get rid of all those dry skin build up. When I am in the shower, I like to spread it all the way to my neck and collarbone. Those areas are just as important as your face. Food for thought: As your skin matures, there is more dry skin build up and when you try to use any products like serums or moisturizers, it will have a harder time to penetrating your skin because it has to go through all those layers of dry skin. A daily cleanser, exfoliating scrub and revitalizing mask. Skin cleansing volcanic lava from France enriched with nourishing calendula, sweet orange and grapeseed oils, cucumber, parsley, and chamomile for healthy radiant, more youthful looking skin. In the evenings there are two products I like to use. The first one is the The Better Skin Epik C Vitamin C Serum and the The Better Skin Mirakle Cream. When you become my age, I am always looking for products that have high contents of Vitamin C.
Vitamin C is also known as ascorbic acid. Vitamin C has a long list of benefits like it helps absorbs iron and Vitamin D into your system, helps prevent or treat common colds, and prevents scurvy. It is considered an anti-aging superstar. Vitamin C can help decrease the effects of the sun and can help brighten and even skin tones. The Better Skin Epik C Vitamin C Serum comes in an eye dropper. It absorbs quickly and I want to protect my skin as much as possible. Summer is just around the corner and I am hoping this serum will reduce my age and sun spots I currently have. A super hydrating, skin tightening, spirit lifting serum that reduces the appearance of fine lines using cutting-edge plant-based technology. Advanced Vitamin C formula works hard to improve the appearance of skin. Botanicals and fruit extracts help guard against pollution. Scented with a hint of lemon. After the serum, I like to use The Better Skin Mirakle Cream. It has a light texture that absorbs quickly. I noticed immediately my skin becomes soft and hydrated. Maybe it is just me but it leaves my face very slightly (hardly noticeable) greasy so I don't mind it using it in the evenings. As a long time runner, I needed a product to help keep my face hydrated during my runs. I don't like it when my skin feels tight and dry during and after a run. I love to apply The Better Skin Mirakle Cream heavily on my face before my run to help protect my skin from the harsh cold elements. It feels like I was wearing a mask and my skin feels amazing when I wash it off. The Better Skin Mirakle Cream can be used both mornings and nights and all year round. 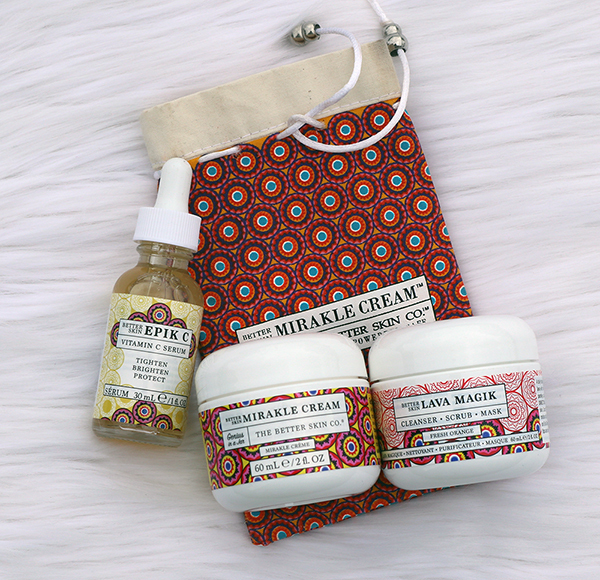 The Better Skin Co. would like to offer one of my readers to win the Lava Magik, Mirakle Cream, and the Epik C Vitamin C Serum. This giveaway will run from May 24th to June 20th, 2018 (midnight EST). Winner, You have 72 hours to reply. You must be 18+ Open to Canadians and U.S. only Good Luck! The Mirakle cream. Nova Scotia, Canada . Wonderful giveaway, thank you for the chance. I'm from Nova Scotia and I'd love to try the Better Skin Mirakle Cream! Ontario and I would like to try the BETTER SKIN ZIT NO MORE. I would first love to try the Lava Magik. I'm from Toronto, Ontario and I would love to try he Miracle Cream!!! I would love to try the Mirakle Cream!!! Commenting from Ontario! I would love to let my daughter try the Lava Magik mask/scrub. She loves those things!!! Hi,I'm here in Newfoundland and another item I would love to try is the Better Skin Mirakle Cream! I would like to try the BETTER SKIN ZIT NO MORE. I'm from Ontario. The Multi Therapy Amaze Balm looks pretty awesome. Manitoba. I'd really like to try the Better Skin Mirakle Cream. I am from Ontario and would love to try the BETTER SKIN ZIT NO MORE! Can't believe in my 40s I still get zits.. sigh. I am from Ontario and would like to try the Better Skin Mirakle Cream first! I'm from Ontario, I'd wanna try the Lava Magik Cleanser-scrub-mask. I am from South Western Ontario and I would love to try the BETTER SKIN LAVA MAGIK: CLEANSER - SCRUB - MASK; I think this would really be nice to use. I'm in Ontario and would like to try the BETTER SKIN MIRAKLE CREAM. I am from Manitoba and would love to try the Miracle Cream!!! Newfoundland and would like to try the BETTER SKIN MIRAKLE CREAM first. I'm from Ontario and I'd love to try the Better Skin Mirakle Cream! I'm in Ontario. I'd love to try the Better Skin Mirakle Cream first. I am from SK and would love to try their Vitamin C serum. Thanks! I live in NB and would like tot try the Lava Magik.